Hello! I’m Mark Renshaw, your local Master Trainer and Canine Behavioral Therapist. I serve all of Loudoun County, Herndon, Reston, Great Falls, Vienna, Fairfax, Chantilly and Oakton! 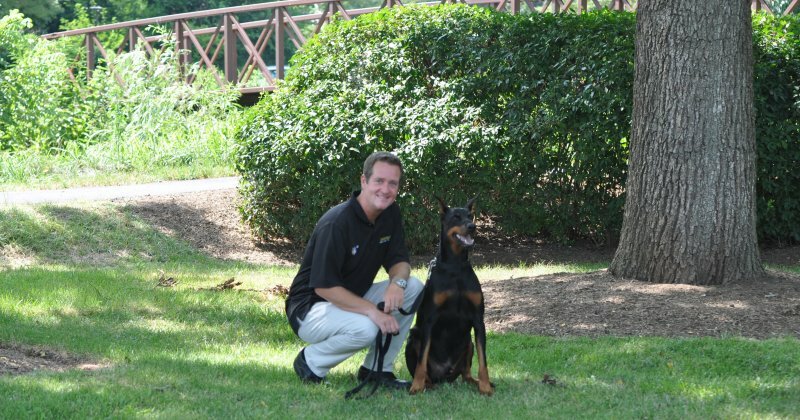 I have owned and operated Bark Busters Northern Virginia for over 16 years, and have had the pleasure of training approximately 6,000 dogs. Having been established as the original office to open in the United States, my passion is to help people to create a much deeper understanding of their dog’s behaviors and foster a unique and loving bond that positions them as ‘the leaders of the pack’. This process is transformational for both people and their beloved companions! I train in and around your home, where your dog is most comfortable and receptive to learning. These are also the areas where unwanted behaviors manifest and can be addressed effectively. The training method is so dynamic, that immediate positive results are often seen within the first 2-3 hours of training. When I first arrive at your home, I custom tailor each training to exceed your goals and expectations based upon your dog’s unique temperament and the problems you are facing. I use a training method which is based in the way in which dogs communicate naturally, it is completely non-physical nor harsh and is designed to empower you to communicate in such a way that fosters immediate and clear understanding. Our dogs are part of our families, and learning how to communicate with them is key to creating a foundation of trust and understanding that can be truly life changing for everyone! I have taken great pride and pleasure in working with many different local rescue groups and animal shelters over the years, and in doing so have helped many dogs overcome serious behavioral issues that may have otherwise been the catalyst for their return. One of many that comes to mind was a 1 year old Boxer mix who had been deemed ‘unadoptable’. The reason he had this unfortunate label, is that he was so reactive towards other dogs that he could not even be taken to an adoption event. Working with his foster family, we were able to not only entirely stop his reactivity so that he became ‘the star of the show’ at his next adoption event that week, but he immediately found a loving home with another dog! This is what drives and inspires me to do everything that I can to create Happy Dogs and Happy Families!! I am confident that I can help your dog overcome all types of aggression, separation anxiety, sibling rivalry, jumping/nipping/mouthing, leash manners, destructive chewing, toileting problems, obedience, boundary training, puppy training and management and much more!! Literally ANY DOG, ANY AGE, ANY PROBLEM!! Mark did an awesome job with our new puppy! He was very helpful, had great insight and literally performed miracles in front of our eyes with our puppy. I would highly recommend Mark to all puppy/dog owners without any hesitation!